Poliment—also known as bole—is a clay-like substance that is used as a base for gilding. It is applied to a prepared surface, usually gesso or chalk ground. Gold or silver leaf is then applied over this base. The poliment enhances the tone and lustre of the gold during the polishing/burnishing process. Selhamin Poliment is a specially prepared and refined bole for priming surfaces for gilding. The best raw materials are combined in the right proportions and processed according to traditional methods. 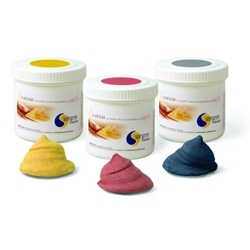 The premixed (wet) material is similar to the traditional dry cone burnishing clay, but is packaged in paste form eliminating the need to crush and dissolve the clay. Selhamin Poliment does not contain any binder.